Leadership isn't about titles any more than status is about credentials. Bio: Ernest Britton is a community arts educator with 24 years in the field. Currently, he serves as the Chief Community Officer for the National Underground Railroad Freedom Center but spent his first seven year's there as Director of External Affairs. Ernest is responsible for recruitment and retention of 300 volunteers, a six resident performing arts series, a national speakers bureau, monthly community dialogues with local nonprofit partners as well as two national conferences: one on youth and the other on the Underground Railroad. 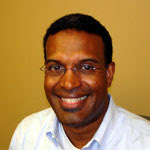 Ernest earned his BA in Arts Management and an MA in Communication. He is an alum of both Eastern Michigan and The Ohio State Universities. He is a native of Cincinnati, an avid raquetball player and the proud father of a 20yo sophmore at Wilmington College in Ohio who plays football for the "Fighting Quakers." FCL: How would you define a leader? Ernest: A leader is someone with a vision of what ought to be; the courage to pursue that vision; the intelligence to realize that other’s contributions will make it stronger; and then the perserverance to stay focused on the end goal for the longterm: vision, courage, cooperation and perseverance. FCL: Who are your biggest influences as a leader? Ernest: My parents for creating a vision; Ed Rigaud and John Pepper for showing me how you bring others into a vision; My Uncle Samuel Britton for teaching me the perseverance to pursue your dream no matter the risks. FCL: What gives you the greatest joy in being a leader? Ernest: The satisfaction of the people I work with. Their sense of accomplishment makes me proud I played a small part. FCL: What is your biggest pet peeve as a leader? Ernest: People who don’t trust in the best of one another—always looking for a replacement talent or someone to blame. FCL: What is your biggest challenge as a leader? Ernest: Matching talents to needs but when you see their satisfaction in the accomplishment it is more than worth it. FCL: Who has impacted you the most in your life as a leader? Ernest: Calvin Day, a Kroger executive who gave me my first job out of college, not because I was qualified but because I was “qualifiable.” I never stopped believing him. FCL: What are your favorite books and what are you currently reading? Ernest: Favorite book is Wicked. It’s fun and ultimately speaks to uses of fear vs inspiration in leadership. A current read while a year old is, “It’s my party too” by Christine Todd Whitman. FCL: What is your vision for business and community leadership in Cincinnati? Ernest: Finding a way to partner at the beginning of projects instead of just as the end. The Community is often left out of the process until the major decisions are made. We do better at some projects but not as well as we are capable of making happen. FCL: Where do you see yourself five years from today? Ernest: Continuing to provide leadership in the areas of community development through Arts & Cultural services. Closing remarks (from Herman): It's true Ernest, leaders who don't trust each other, or their people, will never accomplish much. Trust is the glue that holds the many facets of leadership together. Without trust it is impossible to accomplish all that leaders are called to do. Leadership expert John Maxwell, in his bestselling book, The 21 Irrefutable Laws of Leadership says, "Trust makes leadership possible. That is the Law of Solid Ground" (pg 58). John points out that a leader must be standing on solid ground with her people before she can influence them. I like to say that trust separates the credible leaders from the frauds. We've seen so many corporate leaders break the Law of Solid Ground over the past couple of years and all have ended up messing up their organizations and people's lives. John concludes this law by saying, "No leader can break trust with his people and expect to keep influencing them. Trust is the foundation of leadership. Violate the Law of Solid Ground and you're through as a leader." (pg 65). This blog is an avenue for highlighting first-class leaders - their philosophies, styles, work, hobbies, dreams and much more! This will be done mainly through interviews and book reviews. The blog owner, Herman, is a doctoral student currently pursuing his terminal degree in Organizational Leadership. Any support of this work will be greatly appreciated.